You can create and read XLSX, XLS, ODS and CSV documents with just one code. File types are detected automatically. 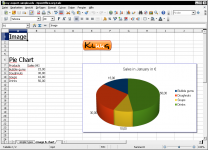 Formula recalculation engine, see http://www.kluug.at/oexport-help/formula-recalculation-engine/ for details. 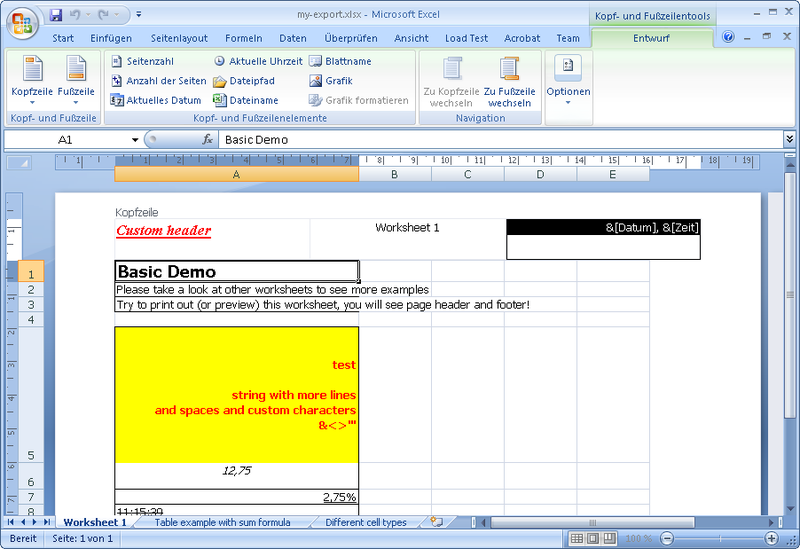 Template engine: automatically process user-defined XLSX/XLS templates. 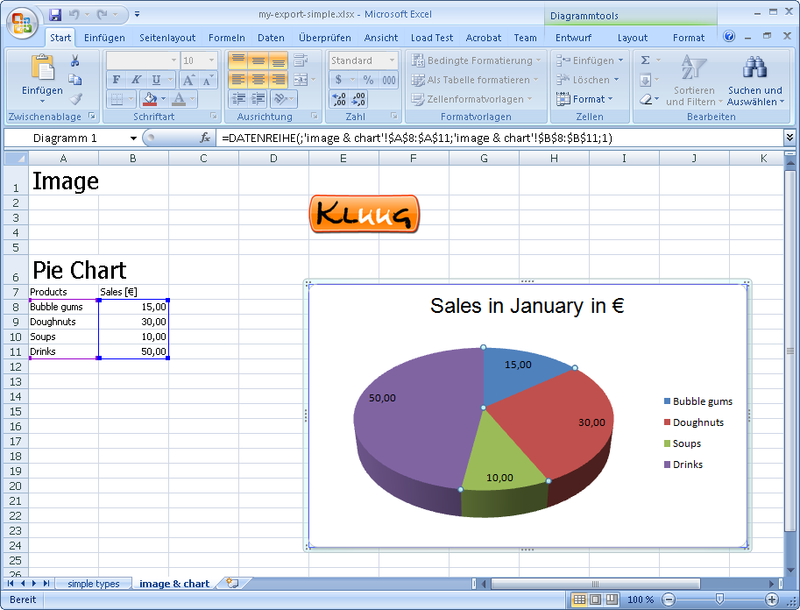 The documentation is online: http://www.kluug.at/oexport-help/. You find an offline copy of the documentation here: oexport-help-offline.zip. 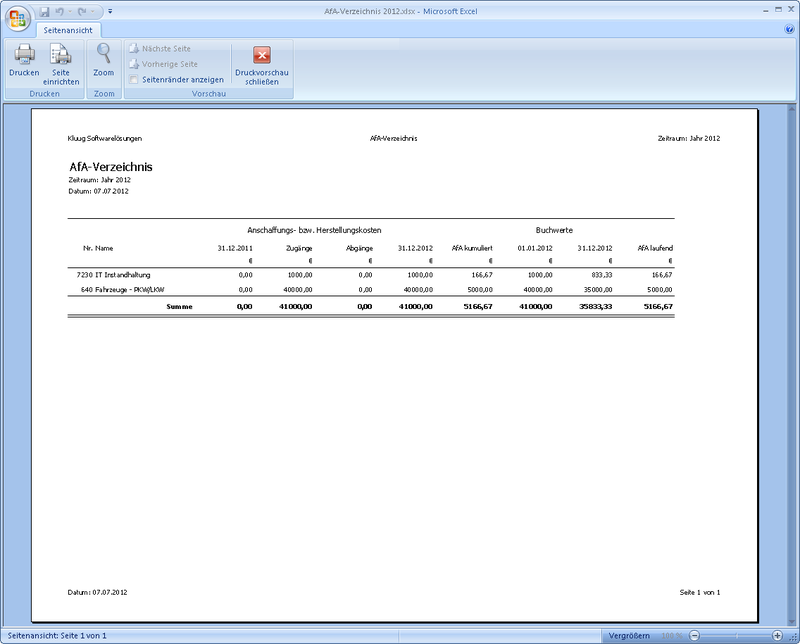 Write-On-The-Fly and Read-On-The-Fly: export and import huge tables without the need to store the whole document in memory. Reasonably fast (see performance table below). Delphi 5, 6, 7, 2005, 2006, 2007: VCL + full unicode support thanks to WideString. 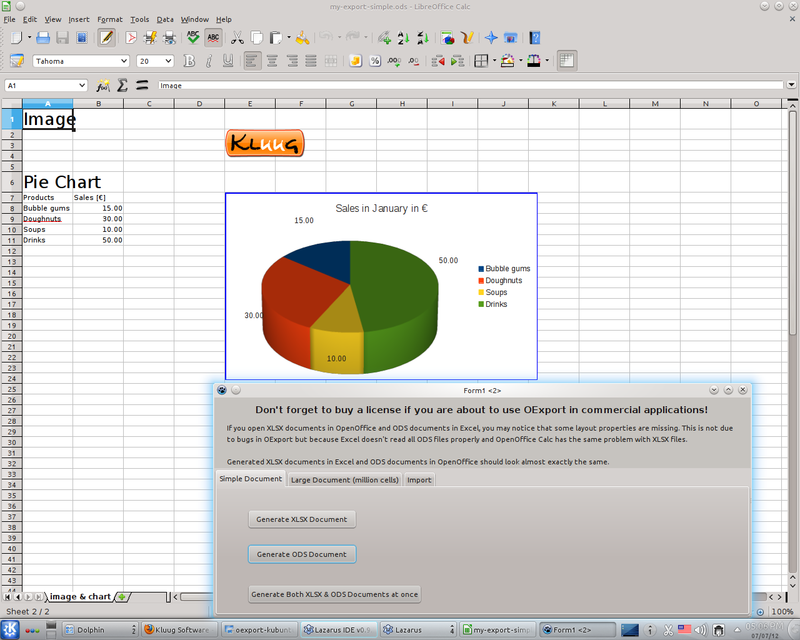 Delphi XE2, XE3, XE4, XE5, XE6, XE7, XE8, 10 Seattle, 10.1 Berlin: VCL + FireMonkey, 32bit + 64bit Windows, Mac OSX. Important notice: Delphi ARM compiler (iOS) was not tested yet and may be unsupported. Currently only loading of XLSX/XLTX and XLS/XLT templates is supported. Automatically replace cell values and modify cells. 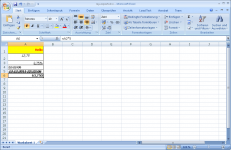 Automatically add and process rows as they are defined in the template. 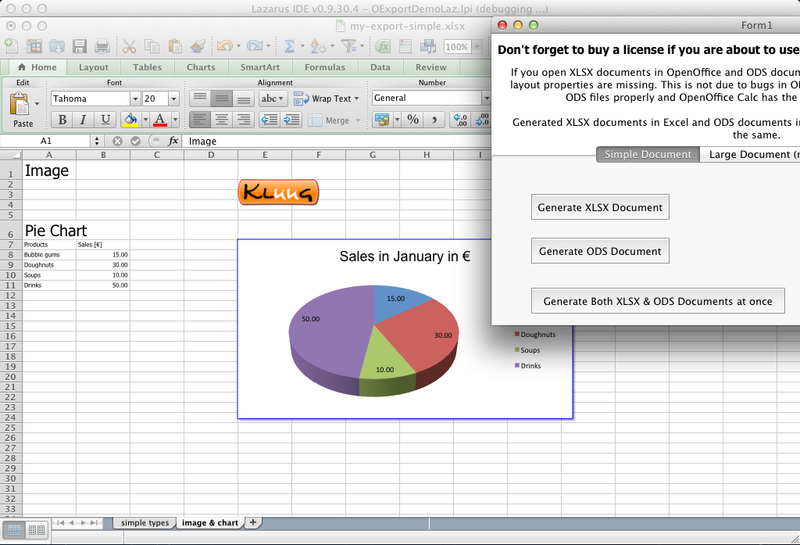 Save the generated template in all formats OExport supports: XLSX/ODS/XLS/CSV! You can generate those files with the demo application you find in the FREE package (see download tab). They have not been edited after the export in any way. Please note that XLS exporter doesn't support images and charts and therefore you won't see them in the exported XLS file. The full source code that was used to generate them can be obtained from the documentation. 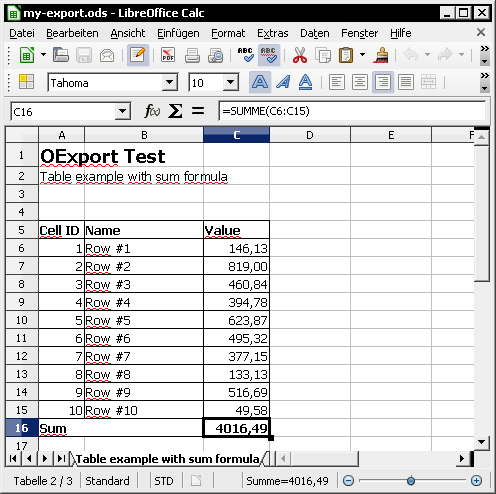 OExport is able to read and write the maximum permitted row and column counts of every supported format. The performance of OExport may vary on used compiler. The best figures are reached with Delphi 2009 and newer. The following times were measured on an old laptop from 2007 (Intel Core 2 Duo, 1.8 GHz, 4.0 GB RAM, Win 7 32bit). 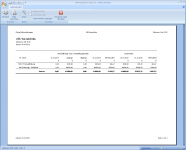 Files consisted of 1 million string cells with shared strings table (SST) either off or on. a. You use the FREE version. b. You have a commercial license for the FULL version. both for commercial and non-commercial purposes. of 40 rows and 10 columns. a. Only developers who work for the license holder company may use OExport. of licensed developers that the license(s) of the holder company provide(s) for. license holder company if all other requirements are met (especially point 3b). b. The license may be transferred only as a whole to a different company. license to a different company and keep 2-developer license. a. The license is perpetual. at the moment of update expiration. If you need a special license, please contact the author. OExport in e.g. the About Dialog of your software. b. If you do have a license for the FULL version, no attribution is required. a. 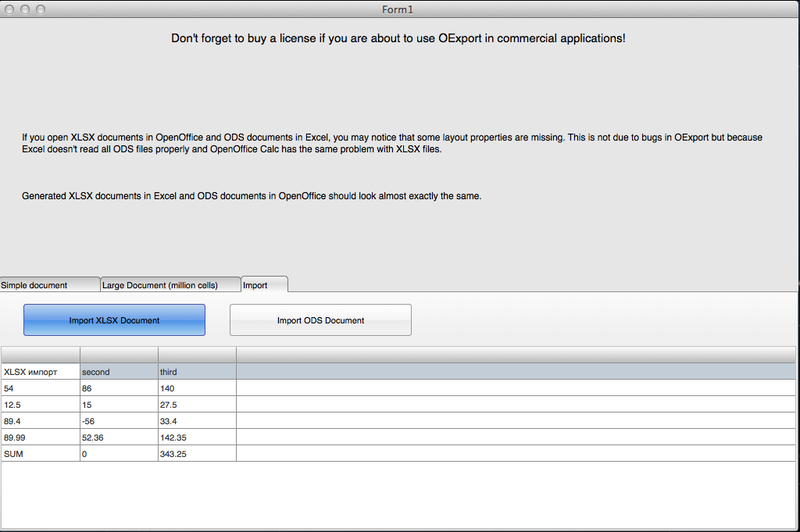 If you purchase OExport, you also get a special OXml commercial license. 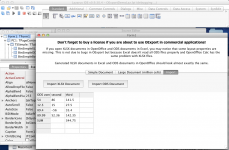 OExport uses OXml for handling XLSX and ODS files). to obtain OXml commercial license as well. This paragraph applies to OXml which is located in OXml directory. All commercial licenses include full source code of OExport that can be used on all officially supported platforms. You may order a roality-free commercial license for a specified number of developers using OExport in your company. 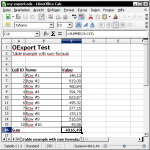 A commercial license allows you to use OExport in any kind of application commercial or freeware that does not break the Section 4. of the license ("DLL library"). You also get 2 years free updates and new releases with priority email support. With these resources you can add XLSX/ODS support to your applications quickly and with ease. Go to OExport online help. Online orders are managed by PayPal. I also accept bank transfers to my bank account. In this case, please send me an email with your billing address and I send you my account number. You receive an invoice per email after your payment. I offer you a 30-days money-back guarantee if you can't use OExport for what is advertised on this page (because of bugs, compatibility problems etc.). - Basic HTML Export (first simple version). - Fix selection if split is used. 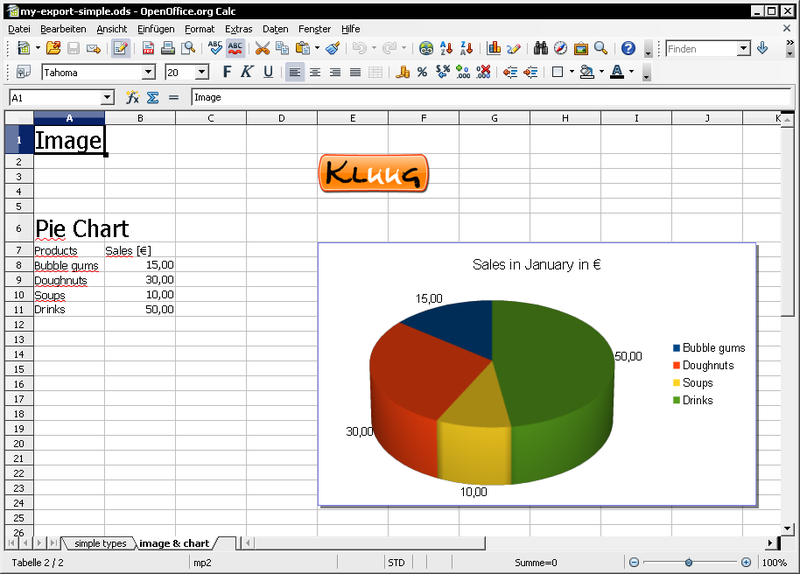 - XLS palette: don't use default and system colors because Excel cannot open cell property dialog if they are used. 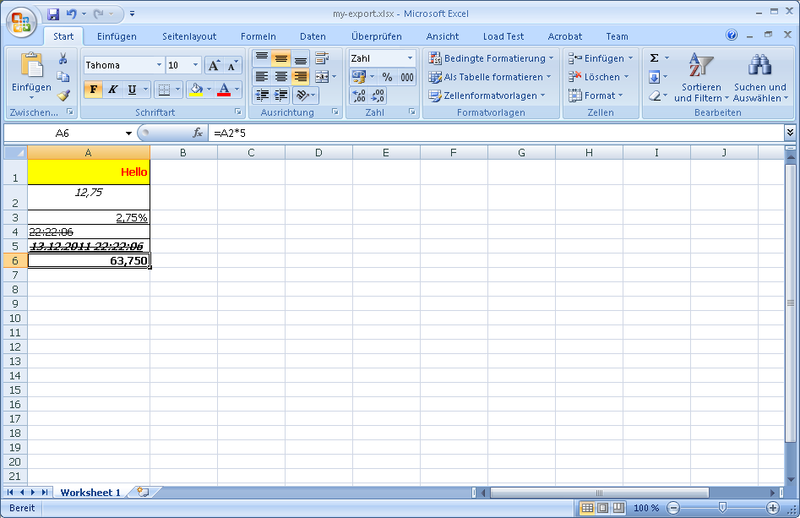 - Handle Excel limit of 1024 page breaks. - OFiller: support named cells. 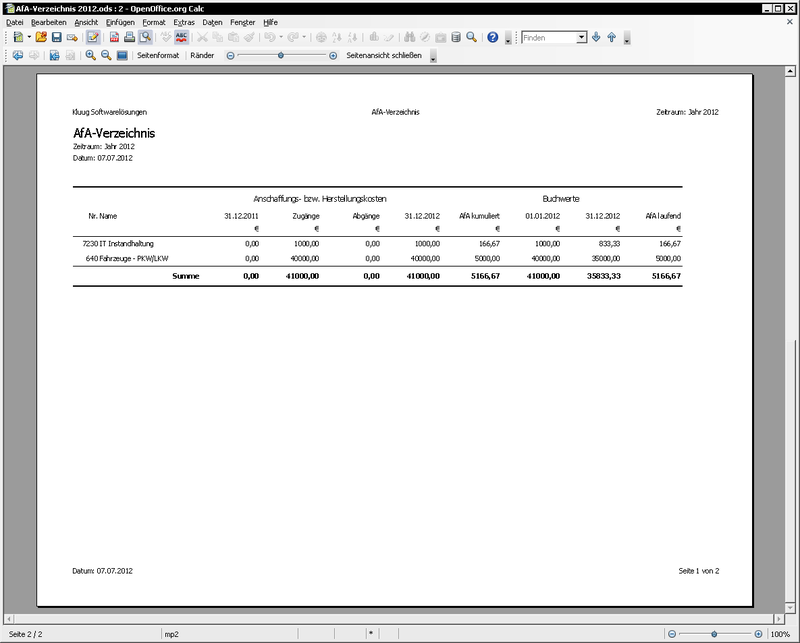 - add XLS support for SUMIF(), COUNTIF() (no recalculation yet). - Fix Delphi 7 performance bottleneck when loading XLSX with a lot of different strings. - add support for Text() function. 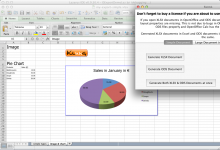 - CSV exporter: use EscapeChar only if the text must be escaped. - fix reading negative RK value. - TOExport: add enumerators to WorkSheets, Rows, Cells. - fix Id collision when comments and images are used in one sheet. - fix truncation of date only and time only values. - OFiller: XLSX: remove formula values in ReplaceCellsEnd - they might be invalid. 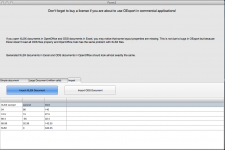 - OFiller: fix XLSX ReplaceCell SharedStrings handling. - OFiller: support replacing float values in XLSX via ReplaceCell. - OFiller: fix removing tabulators. 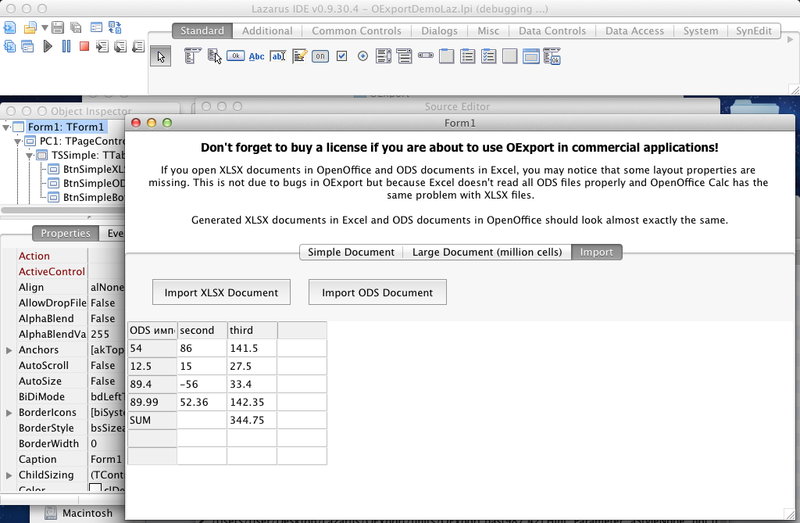 * If you want to update OExport, you have to update OXml as well (OXml is included in the zip package too). If you use packages, you have to recompile them! 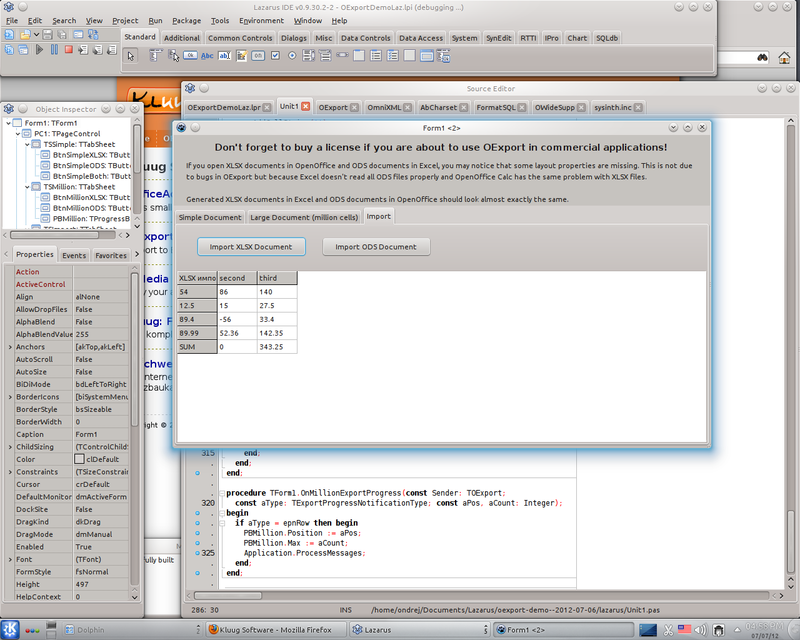 (Both OXml and OExport packages). 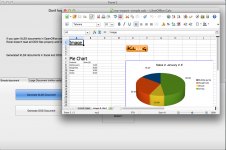 - support of prefixed XLSX documents (typically from Mac OSX). - added support for comment images. - added OExportXLSXCustom (support of custom files in an XLSX container). - added Polish translation (from Michal Glebowski). 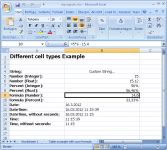 - fix relative formula evaluation if reference cell doesn't exist. - fix problem with replacing n to m in formatting strings. + Delphi 10 Seattle support. * prevent AV during import of XLSX comments. 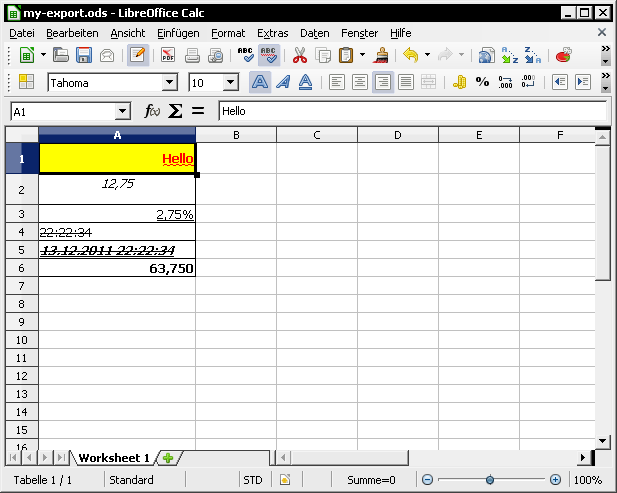 * added ApplicationVersion and set default values for Application/ApplicationVersion to meet Excel 2007 due to LibreOffice compatibility. 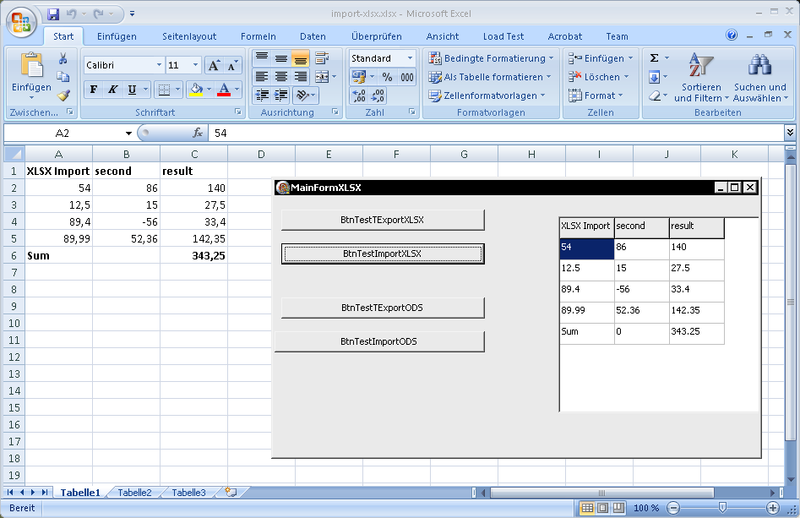 + New property TOExport.AutoAdjustFormulas - adjust formulas when inserting/deleting rows/cells (the same that Excel does). 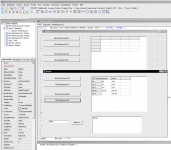 + New properties TExportChartAxis.MaxValue and .MinValue. + OFiller procedure ReplaceImage changed to function - it returns number of replaced images. + Multiple chart support (TExportChart.SubCharts). 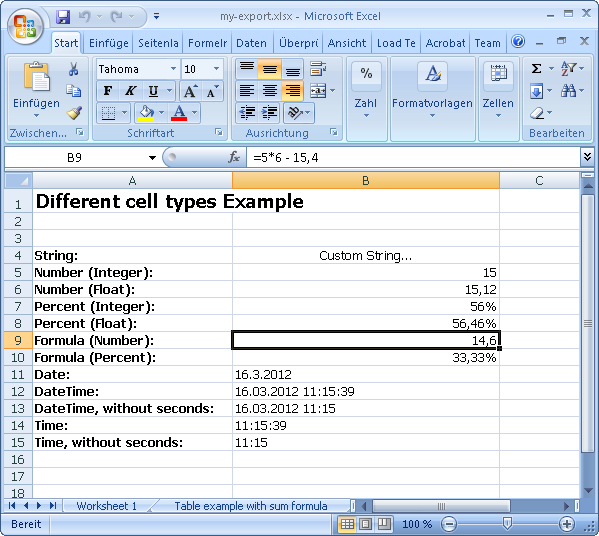 + Support for enhanced TExportConditionalFormatting and TExportDataValidation ranges - row, col and custom ranges. * You can use the lists above for adding CondForm or DataVal for custom ranges. + Added TOExportTemplate.FindStringCellsByStrPos. With it you can find a cell that contains a substring. * Images in cells with colspan were not exported. * Fixed bug in DOCX ReplaceImage. 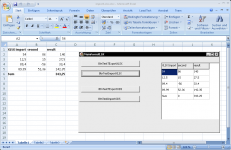 * XLS relative formula bug fix. 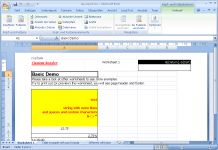 * Recalculate formulas when loading XLS and cell type doesn't match formula result. * ODS cells with colspan bug fix. - Removed TOFileStream from OFileUtils.pas. TOFileStream is declared in OWideSupp.pas in OXml. + TCellHAlignment - new options cahCenterContinuous, cahDistributed. 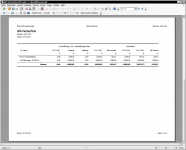 + XLS formulas support references accross worksheets. 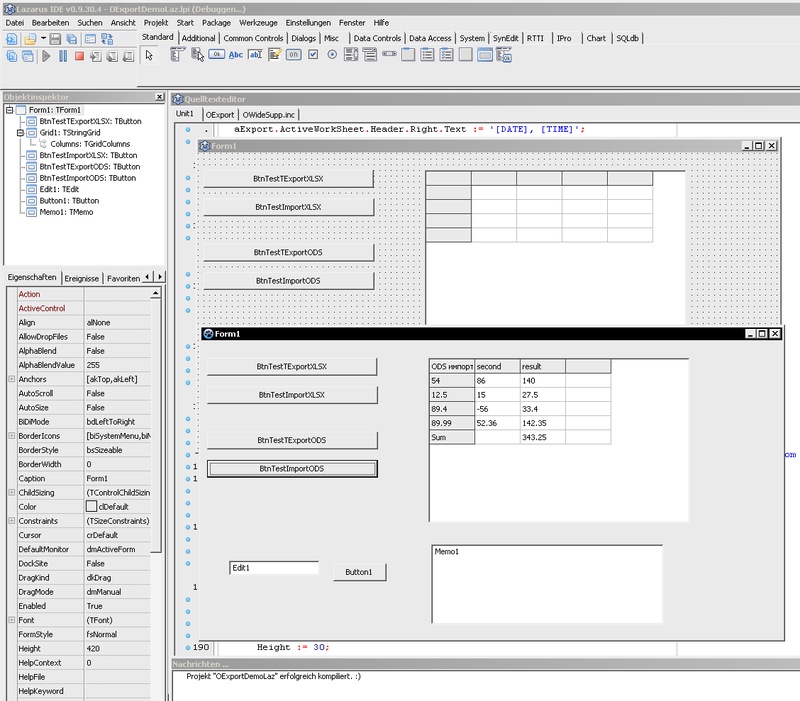 + TExportChartData.ShowLabels changed from Boolean to TExportChartDataShowLabels.
! Use [eslValue] for true. 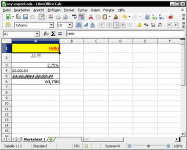 * Improved formula recalculation engine and XLS formula support. * Bug fix: zero date/time was exported as empty cell. export in Lazarus, Delphi XE and older is faster and uses less memory. * Some other small improvements and bug fixes. (Please see the installation package for a complete change log). 3.) 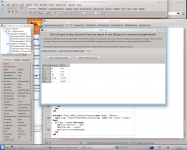 Run the demos from your Delphi IDE. The FREE/TRIAL package contains OXml already. OXml is licensed under CPAL 1.0.